As the name implies, the Savana Cargo is for hauling stuff, and as such, don’t expect much in the way of luxury. But don’t think sitting in it will feel like punishment either, GMC knows that some people have to spend quite a bit of time in vans like these, and both the seats and ride are actually quite comfortable. There are even some decent options when it comes to the radio, but what it really offers is cargo space, lots of it. 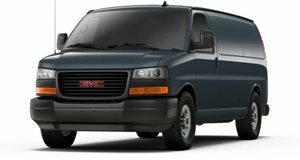 GMC also provides stability control and all-wheel-drive to help make sure your cargo gets where going.